Being president is more than just glamorous trips to foreign countries and hard-balling enemies in Washington. Sometimes, being president means putting on a suit and addressing the family, friends, and entire country of someone who has died. Unfortunately, President Obama has performed this duty more than once. 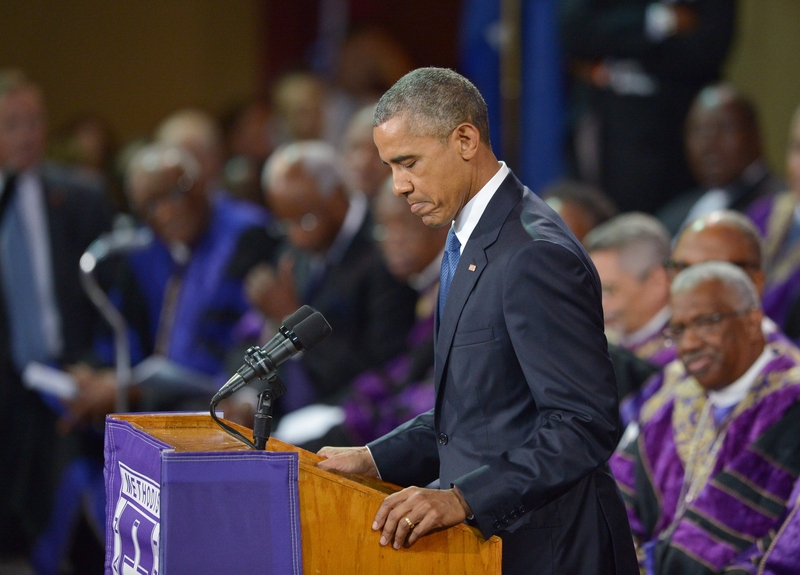 On Friday, Obama spoke at the funeral for Rev. Clementa Pinckney, a victim of the Charleston, South Carolina, shooting, and it's not the first time a president had to deliver a heartbreaking eulogy. As a nation, out of this terrible tragedy, God has visited grace upon us for he has allowed us to see where we've been blind. He's given us the chance, where we've been lost, to find our best selves. In the final minutes of his eulogy, Obama surprised everyone by breaking out into "Amazing Grace." The crowd gathered around the commander-in-chief and joined him in song, clapping and cheering. He named each of the victims and proclaimed that each one had grace. This eulogy was especially heartfelt given the fact that the president personally knew Pinckney. They met when the reverend was an early supporter of his 2008 presidential bid, CNN reported. Presidents have had to deliver many high-profile eulogies. Whether they knew the victims or not, the speeches always have an effect on national attention. Here are eight of the most emotional ones. Current presidents sometimes take on the task of eulogizing their predecessors. In 1994, President Bill Clinton took on speaking at the funeral of Richard Nixon, a controversial political figure whose time in the White House was marred by the Watergate scandal. In 1995, President Clinton traveled to Oklahoma City to speak in remembrance of the 168 people who died as a result of the April 19 bombing. Today our nation joins with you in grief. We mourn with you. We share your hope against hope that some may still survive. We thank all those who have worked so heroically to save lives and to solve this crime — those here in Oklahoma and those who are all across this great land, and many who left their own lives to come here to work hand in hand with you. We pledge to do all we can to help you heal the injured, to rebuild this city, and to bring to justice those who did this evil. Many Americans remember exactly where they were on Feb. 1, 2003, the day the Columbia space shuttle exploded, killing seven crew members aboard. Three days later, President George W. Bush delivered their eulogy, surrounded by thousands of NASA employees and their families. Each of these astronauts had the daring and the discipline required of their calling. Each of them knew great endeavors are inseparable from great risk, and each of them accepted those risks willingly, even joyfully, in the cause of discovery. Mattie Stepanek was a 13-year-old poet and motivational speaker who published five volumes of poetry before his death from a form of muscular dystrophy in 2004. He said his hero was President Jimmy Carter, who said that although he has met kings, queens, presidents, and prime ministers, Stepanek was "the most extraordinary person whom I have ever known in my life." In 2004, President George H.W. Bush delivered a eulogy for another former president: Ronald Reagan. Margaret Thatcher and Ronald Reagan, Jr. also spoke at the funeral. George W. Bush spoke at the 2007 funeral of former President Gerald Ford in 2007 in Washington. I will always cherish the memory of the last time I saw him this past year in California. He was still smiling, still counting himself lucky to have Betty at his side and still displaying the optimism and generosity that made him one of America’s most beloved leaders. Obama remembered Edward "Ted" Kennedy after the senator died of brain cancer in 2009. We can still hear his voice bellowing through the Senate chamber, face reddened, fist pounding the podium, a veritable force of nature, in support of health care or workers' rights or civil rights. And yet, while his causes became deeply personal, his disagreements never did. While he was seen by his fiercest critics as a partisan lightning rod, that is not the prism through which Ted Kennedy saw the world, nor was it the prism through which his colleagues saw him. As someone who is close — politically and personally — Obama could speak with respect and true knowledge in his eulogy of Beau Biden, son of Vice President Joe Biden.